I recall being crippled with pain much longer than that and now it seems, I have to contend with other reactions to mosquito bites. I woke on Friday morning thinking I had a tumour in my right arm. “Where did that come from?” I asked myself. It was early, and still quite dark out, and I lay there feeling this enormous lump wondering what had gone wrong when my broken bone healed. Surely that was the only reason I’d have such a huge lump. The word ‘cancer’ quickly entered my mind. 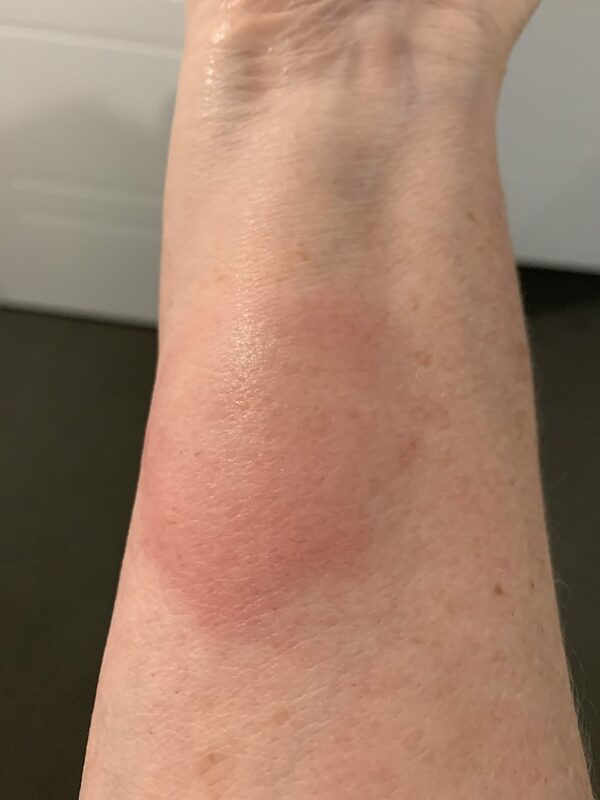 But then I got off the bed and stumbled out to the kitchen to put the kettle on and, as I noticed the colour, I remembered scratching my arm throughout the night. As it happened, the previous night, as I opened the screen door and stepped back inside the house, I noticed a mosquito sneak in before I closed the door. But I thought nothing more of it until standing there in the kitchen waiting for the kettle to boil. But I decided it was time to fight back. We do have our home screened against insects, however, the extremely dry conditions we’ve been experiencing have caused these flying bloodsuckers to seek moisture wherever they can find it. And that just happens to be in and around my plants – the plants I water faithfully to keep alive. 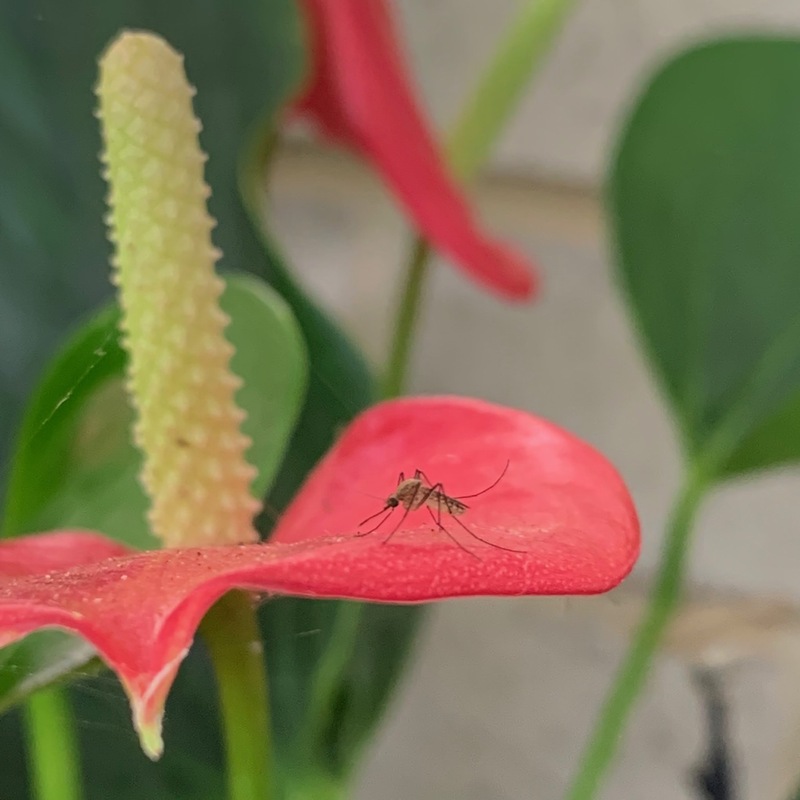 I admit I’ve been struggling with how to keep the mosquitoes away from my plants and know that I do need to create a bug-free zone around them. Less than a week ago, I was out watering a little too late one afternoon and was attacked mercilessly from the knee down on both legs. I scratched (and cursed) for four days – or more – and was not happy, but I guess that was my fault for being out there right on dusk when they are most active. Yet even mornings aren’t safe and I captured this photo of a flying vampire on January 20. I think it was a little sluggish because my anthurium was not providing it with any nourishment. I hate mosquitoes so much. But thanks to my friend Marilyn, I now have a wonderful plan of attack. This is my new, powered, bug zapper. Guaranteed to provide ‘Pest Free Entertaining’ because it attracts and kills mosquitoes, moths and other flying insects. 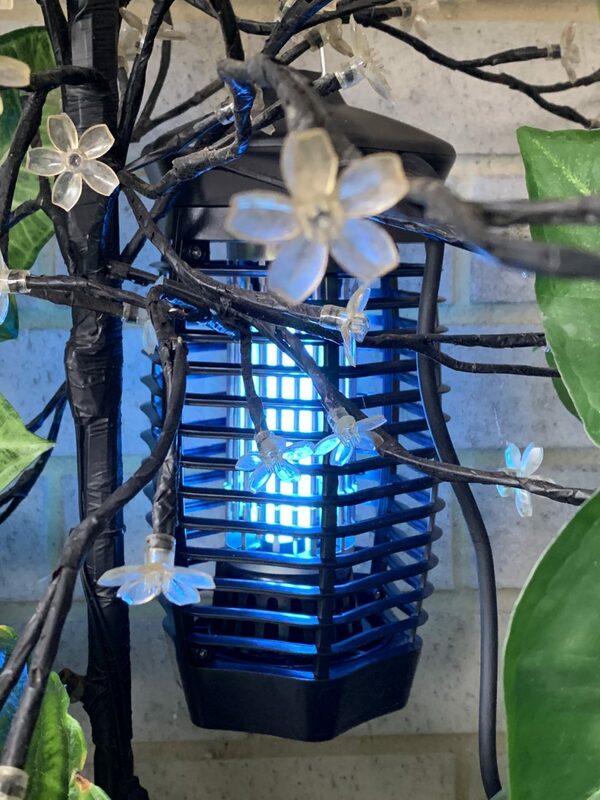 I had never even considered getting a powered bug deterrent, never even thought it would be the answer to keeping mosquitoes out of my plants. And it wasn’t the most expensive one available either. Following Marilyn’s advice, I purchased the cheapest one I could find and have placed it in the vicinity of the largest number of mosquitoes. Less than 20 hours after hanging it on my LED Tree Light (because I didn’t have anywhere else to put it) I walked outside this morning, and there’s not one bloodsucker to be seen anywhere. Sure, there are other bugs, but they are not the biting kind and we will eventually get a hook to hang it up a little higher and (perhaps) out of sight. But that’s neither here nor there. For now, it’s where it needs to be, and is already doing a marvellous job. I think we can now return to enjoying meals outside without being eaten alive. You poor thing! Bloody mozzies. We don’t have that many around us but the rain this week has brought them out. I use a coil burner which works quite well for us in the evenings but that’s only for a courtyard. Simon was completely covered in bites after an evening session on the golf course – we need extra protection! Oh no. There is nothing worse than being attached by mosquitoes. I agree, we need extra protection and lots of it. I hate those blood suckers toooooo! Feel better with that bite. Almost 100% now, just a minor bit of swelling left. I won’t be so blasè about them in the future. You can get an oil from hardware stores designed specifically to kill mozzie wrigglers, a few drops go onto any drip trays you might have. I also bought one of those wrist bands, I opted for a Citronella one thinking that would be less of a worry than chemicals on my skin. Ross River Fever is certainly a nasty bug to get. Thanx Sue, I’ll investigst thst oil for my drip trays, though I am very pedantic about the few I have not becoming breading places. As for the citronella – it doesn’t work on me, they can still smell my O- blood, apparently THE blood type they are very partial too. I’m lucky they seek me out and at the moment we don’t have a lot around. Too dry, I think. That’s always a bonus, Sue. “Bring on Winter!” I say. Maybe not you but we could certainly do with a little rain, Winter or not! We could do with some rain. All that water missed us completely. Thank you for the tip. And that RRV was horrible and something I wouldn’t wish on anyone.